You’re talking with someone. He asks a question demonstrating he didn’t understand or hear what you said. 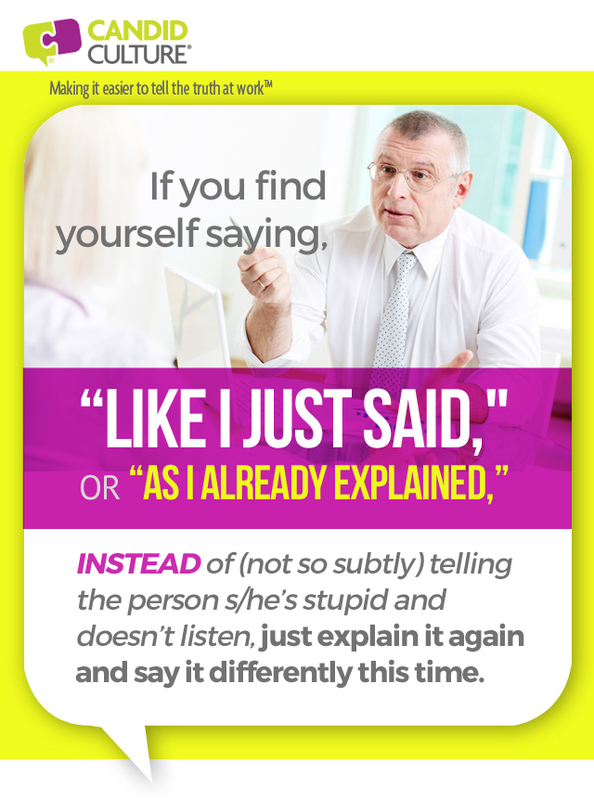 You let out an exasperated silent or audible sigh and say, “Like I just said…” Saying “like I just said” or “as I just explained” tells the person that you think he’s stupid or doesn’t listen. Both might be true, but saying so won’t help your relationship. I consider myself reasonably smart. And for the most part, I listen. If I ask a question about something you said, consider the possibility that your explanation wasn’t clear and find a way to rephrase what you said the first time. Resist the temptation to tell me and the people you work with that we’re stupid. Letting people save face is an art that takes patience, good communication, and the desire to have good relationships. Good communication tip number one: Give people the benefit of the doubt. Assume good. People are doing what they know to do. Good communication tip number two: If someone doesn’t understand what you said, take responsibility for delivering unclear information. It’s easier to change your communication style than alter someone else’s style. Good communication tip number three: Put your desire to have good business relationships above the desire to be right. Good communication tip number four: Consider that you may not explain things in the way others learn. Vary your communication methods. Most people don’t learn solely by hearing. Make your explanations hands on and/or visual, and you’ll reach more people. Good communication tip number five: Bring your patience to work. It’s tempting to tell people where they’re lacking, but it won’t get you very far. Say what you need to in order to get your point across. And if people are unclear, know the easiest thing is to alter your message. Take the path of least resistance; let people save face. This week’s blog subject is outstanding advice. Thank you for continuing to provide help to us for more clear and direct communication. Thank you, Mark! It makes me so happy that you’re finding the blogs helpful! thank you so much for the lessons to teach in these blogs. They are straight to the point and full of valuable information. I am applying your advice daily. I’m so glad to hear that, Karen! Thank you! Your support means a lot and I’m glad you’re finding the blogs useful. I used (and shared) tip #3 just today. Kind of a “wow” moment for a colleague. Well, for me too! As good as it feels to be right, getting along with and being respected by your coworkers feels even better! I’m glad I could share a little inspiration with you! Thank you so much for sharing, Nancy!